As one of the America's best loved restaurants, Gage & Tollner is very well documented. 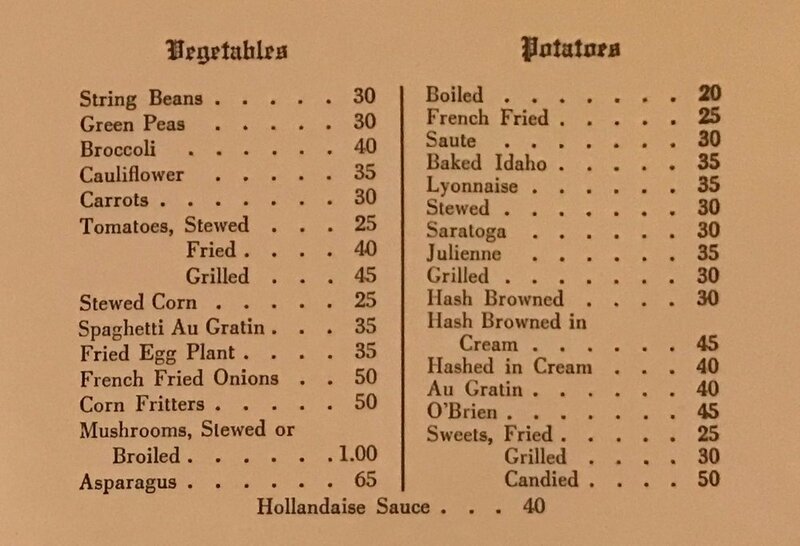 We've found menus going back to 1919, when Eugene Tollner was still running the show. Throughout the 20th century, the G&T menu remained remarkably consistent, despite the passing trends, until Peter Aschkenasy took over in 1989. We've been poring over the old menus, looking for inspiration, and finding plenty of it! The earliest menu we've found! Highlights include 24 preparations for Saddle Rock oysters (known for their large size), chicken gumbo, a "plain, whole" lobster for $1.85, and this plate: "Fried chicken, half, with Bacon and Corn Fritters." Sounds great! What's most notable here is how much hasn't changed in 37 years... but this menu adds two of our favorite things: cocktails and dessert. Inspiration abounds — can't wait to serve up classic whiskey smashes, Jack Rose cocktails, and Nesselrode pie, a forgotten NYC classic made with chestnuts and rum. When Edna Lewis took over the kitchen in 1989, the menu finally changed significantly, and Gage & Tollner became renowned for authentic Southern food. Lewis's menus are typewritten and uniquely dated, reflecting her market-driven cooking style.